Social media is an interesting place, isn’t it? The unchartered but exciting waters of online networking and communication certainly gets people going. Social media has given much to many but it’s not easy to be a real success on social media. Going viral is one of the main attractions of any social media platform mainly because that’s how most hear about social media when they don’t even use it – it gets everywhere when it’s viral! We’re often asked how you can make content can go viral and how you can create content that makes people, millions of people, click and share content. The true answer to that is… no one really knows. If going viral was easy, we’d all be doing it… and then it wouldn’t be going viral… it would just be… well… normal! How many people are online at the moment? How many people were online last week? How much content was put out on the internet and how much went viral? You probably don’t know exactly how many people were online last so I did a quick guesstimate! There are also 500 million Gmail users, 347 Million LinkedIn users and 300 hours of video uploaded to YouTube every minute! So if you take the top channels (Google, Twitter, Facebook, Instagram, Vine, Whatsapp and Snapchat) you’ll find you have 4.82 Billion users per month updating social media and surfing the web. YouTube don’t publish the active monthly users but we know that over 30 Billion videos are watched each month. When you add all that up (on a very large calculator) you’ll see that there are a phenomenal, almost incalculable, number of people online sharing and searching. Even taking into account the fact that one person can have more than one account, that’s a lot. Almost 5 Billion people sharing and searching online each month. If we divide that by four to get our very guestimated weekly users we get 1.25 Billion. Last week two things went viral. Still think you can just go viral? Going viral can have huge effects for a business, person, celebrity or organisation and I understand the thirst for it. But when you look at the stats it’s actually easier to win the lottery (1 in 14 Million) than go viral online (1 in 1.24 Billion). Last week two pieces of content went viral. They went crazy and the whole internet was talking about them. They were not planned. They were not adverts. They were not even supposed to happen… but they just went viral. Going viral for these two pieces of content was never the intention and it was only because they fascinated audiences and got the world talking that they went viral. I am of course talking about Madonna in her cape and that bloody blue and black dress! #TheDress. Madonna went viral after falling over at the Brits and a photo of a dress went viral thanks to some strange visual trick that not all human eyes can see. But why did Madonna go viral? Madonna went viral but (despite the odd conspiracy theory) it wasn’t for the reason she would have wanted. She took a tumble, and because we were all watching and tweeting every single move from the Brits, and had been all night, when Madonna took to the Brits’ stage the social stage was warmed up and ready. A simple wardrobe malfunction was all it took for the social media channels to go crazy. The Queen of pop crashing down in front of millions, probably billions, of TV viewers and so many more on social media too. A Vine video was created of the tumble in seconds and Jo got over 200 Retweets when she shared it. The original Vine has had over 13 Million loops at the time of writing this. Now THAT’S viral! Why did this go viral? Well it’s a pretty big story isn’t it? Madonna is extremely famous and she was performing at the end of the Brits after much ridicule from the hosts, and everything was set for the perfect storm. Falling over is also one of the most watched types of content online as well (we love a good trip!). It had all the ingredients of viral content: fame, fortune, falling and capes… Not all viral content has a cape, but it should, right?! What did going viral mean for Madonna? She trended on Twitter for a very long time and she got media attention for much longer than that. Madonna was all over (the floor) the next day in the tabloid and news channels. You can’t buy that type of publicity – and they do say no publicity is bad publicity. She also got over 104K Likes on Instagram after she posted that she was OK. She then went on to do interviews where she discussed what had happened. Her new single was a new entry into the UK charts at Number 26 so that’s all good for her bank balance too, isn’t it?! You can’t really measure the impact it had on Madonna but I would say that that in itself shows how huge it was. Black, blue, white or gold – this dress went viral! The other viral story from last week was really very bizarre. #TheDress was the story that split opinion across the globe from a simple but very interesting image shared on Tumblr. Due to over exposure and “variations in the number of photoreceptors called cones in the retina that perceive the colour blue” we were all confused and it got us shouting White and Gold or Black and Blue at the internet. And yes, couples have even broken up over it. Why did #TheDress go viral? This story is very simple for us to get involved with. All we have to do is look at the screen. The low threshold for admittance was much like the Ice Bucket Challenge. All we needed for the ALS Ice Bucket Challenge was a smartphone, some ice and a bucket. #TheDress was even easier than that though, and of course it had the added bonus of being really annoying as no one could agree! Controversy and of course intrigue got everyone talking about it. What did this mean for the original social sharer? 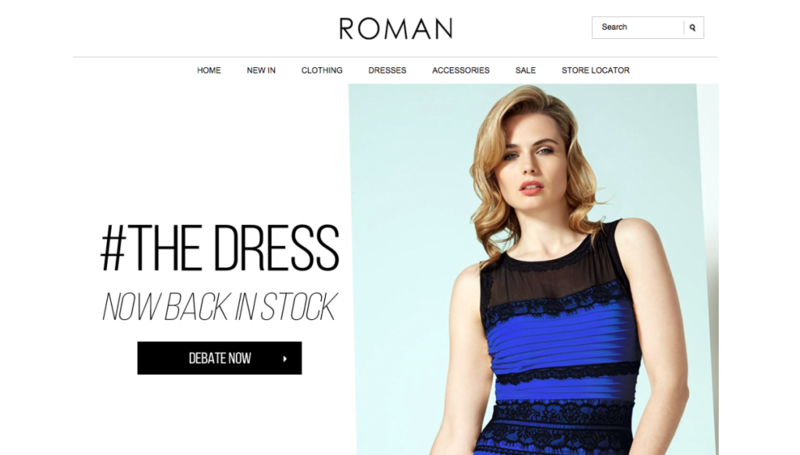 Michele Bastock is the dress designer from Roman Originals. The Blue and Black dress is currently out of stock but other colours and designs are available. Michele told CNN that she will now be creating a white and gold dress thanks to public opinion after possibly the most extensive market research she’s ever done! 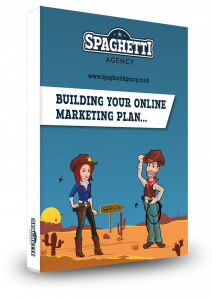 Michele also saw huge website traffic and a big boost in sales and the company reacted by changing their home page to reflect the story. Roman Originals have a well-deserved boost in sales and the way they responded has been really good. We’re not sure the six month turnaround for the white and gold #TheDress will work out though. People won’t care by then. The iron is hot and needs stricking now, Michele! [Update 4/3/15] Since posting this blog I was informed on Twitter and by the comment on this blog that the White and Gold dress will be made available very soon… sooner than six months, thankfully. Nice work Roman Originals! You can’t just go viral, sorry! Both the examples from last week have many things in common. They were both simple to engage with. Both stories meant something to a large audience even if you didn’t like Madonna or dresses. Both the viral stories were very simple to talk about and the entry level for communication was very low. Neither of the parties involved in the content even shared it on social media or meant anything like this to happen. 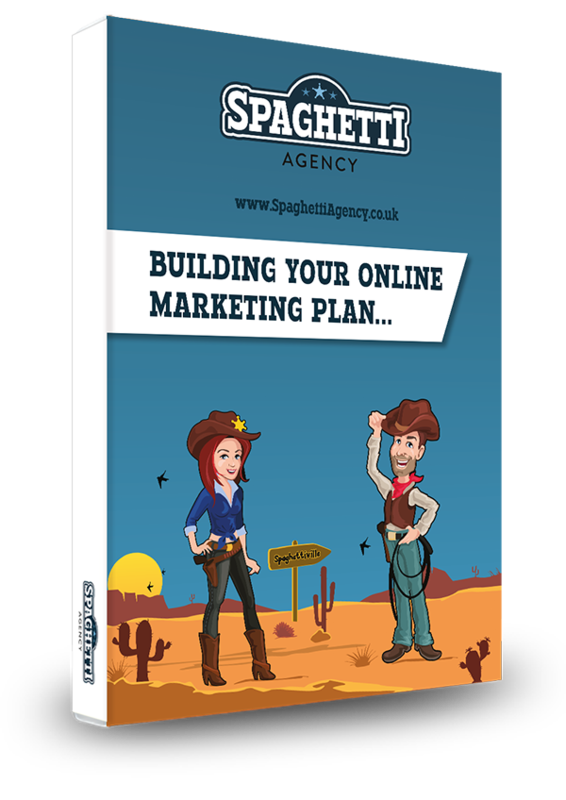 When you think about going viral you’ll try to create it yourself and come up with amazing ideas and plans but the fact is – people don’t care! People care about how good or current they look when they share your content. Social Currency – People love making themselves look good, whether it’s in real life in front of their friends or on social media. Unexpectedness – Susan Boyle was a great example of this (as was Madonna). Triggers the right emotions – Amusement, anger, fear and of course telling people black is actually gold until you’re blue in the face! Usefulness – Online sharers like to be useful and will share great content. Identity – When people say “I like this”, what they are actually saying is “I AM like this”. How true was this for the dress debate? Stories – Storytelling is of course alive and well and if we have a solid story behind our content we have a greater chance too. You also have the added boost of people following crowds. Once it starts then others will look on and want to be involved. This will only come if you tick all the other boxes though. 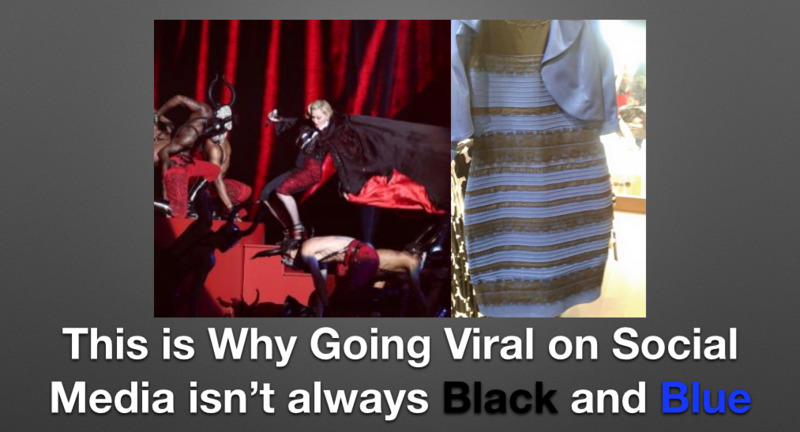 Why did #TheDress and Madonna go so viral? What did you think and why did you share them? Did you see black and blue or white and gold?! I’d love to hear from you in the comments below. Please share this is you enjoyed it by clicking the social buttons below. Was up to speed with #TheFall but somehow missed all the furore over #TheDress (was offline celebrating big birthday!) so first I heard about it was yesterday – wondered what the hell R1 DJ was on about! I’m in the #whiteandgold camp. How about you two? I’m black and blue. Jo is predictably white and gold. We’re like two sides of a coin, aren’t we?! Although we’ve not split up… unlike some couples did according to some reports last week. The Dress has gone mental, not viral. I know 1st hand experience how mad it has gone, the press from UK, Japan, Australia and USA have all been in the Roman’s design office over the last two days. The owner of the dress appeared on the Ellen show in the USA last night. The materials for a white and gold dress were sourced yesterday. The white and gold dress was made today. I can’t say any more!! It’s actually a really nice dress… I hope it was worth their investment! Good for them for capitalising on it. A very enjoyable read indeed, love the whole evaluation on current viral social media. It just shows the power that social media has. Just getting that timing and mood, but it is impossible to pre-empt – so striking whilst the iron is hot is a must! Anything with a very low entry level for participation should work well for viral content as it enables the masses to participate. The blue and black dress was certainly that. All you needed were your eyes and you were in. A simple phenomenon that probably can’t be replicated again and of course it was never meant to be a viral piece of content in the first place. Interesting little topic, isn’t it? Yes I agree, any open question on a light topic offering participation, is likely to build and invite opinion – It sort of unites people without there being too much pressure to commit to being the expert, or having to know all the answers. People sometimes just like dipping in and out of conversation as and when. It may be Interesting to revisit this topic on some more viral phenomenon later down the line. Watch this space, we may of cracked the code by Christmas. Good luck with that, Jo. High brow is great but if you want mass comments then keeping it simple and easy-to-enter is key.